One of the first Presbytery of San Jose meetings the Rev. Sammie Evans attended as the new pastor at Stone Church of Willow Glen was to hear a presentation from the Rev. Dr. Kathryn Threadgill on Presbyterian Mission Agency’s Vital Congregations Initiative, which is designed to help churches live more faithfully as disciples of Jesus Christ. Having just moved to San Jose from Broad Street Ministry in Philadelphia, where she’d participated in a 1001 New Worshiping Communities residency program, the language resonated with her. As part one of her first reports to the session, she presented the initiative as a tool for ruling elders to consider using as part of their work getting to know each other. As the session brainstormed how the elders might work through the initiative’s seven marks of congregational vitality, session members decided to go through each one month by month. In May, the session voted to participate in the initiative — and 35 people signed up. Evans, who preached a sermon series on church vitality as part of the revitalization initiative launch, said worshipers have appreciated talking about their experiences as an intergenerational church — describing the church as a unique place. As Stone Church of Willow Glen goes through the initiative, she has noticed a couple of other things. As they go deeper into Scripture, people who have known each other for decades are learning new things about one another. “It’s been extraordinarily meaningful to me, to be vulnerable with them as we share our stories,” she said. Evans also had conversations with the congregation about the Bible studies for the seven marks, which have a more evangelical bent to them. That’s been fascinating to her. 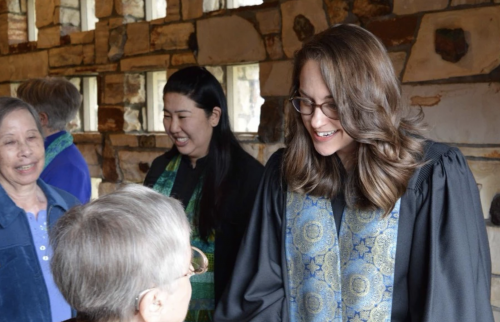 Members and friends have been able to express the discomfort they feel with the word “evangelism.” Hearing her integrate evangelism with justice has helped parishioners let go of some of the negative connotations they have with the word. Adams is also part of the Vital Congregations pastoral cohort at the Presbytery of San Jose, one of the pilot presbyteries participating in the two-year initiative before it’s launched nationally at the Presbyterian Church (U.S.A.)’s 224th General Assembly (2020) in Baltimore. The Office of Vital Congregations is part of the PC(USA)’s Theology, Formation & Evangelism ministry. To download a basic information packet for presbyteries interested in going through the revitalization process, click here. God, you call us to proclaim good news in word and deed. Grant us courage to be brave, bold and imaginative disciples in all we say and do. In Christ’s name. Amen.